Antiquarians and ecclesiologists have not been very kind to our parish church, begins Terence Smith's guidebook to this church. 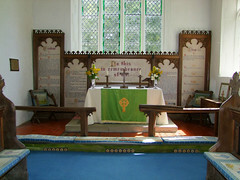 Certainly, they have been dismissive, but I think this is a lovely little church, even if it is not full of interest. You come to it from Bradfield Combust, along high tree-lined lanes that recall the memory of Arthur Young senior, of Bradfield Hall, who first planted them more than 200 years ago. The Youngs are one of two remarkable families in this area, but probably they would admit to second place behind the St Cleres, who were Lords of the Manor here throughout most of the Medieval period. They were great crusaders, and the image of St George in crusading armour at Bradfield Combust, despite post-dating the crusades by two centuries, may be based on a St Clere family portrait. 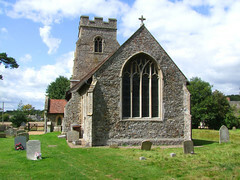 Much has been made of the fact that this church bears a unique dedication in England for a medieval church. 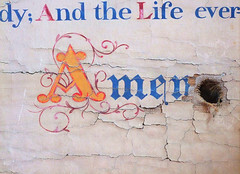 St Clare was a companion of St Francis, and lived in the 13th century, by which time the Parish system and its churches in England was already well-established (there aren't many St Francis dedications, either). Sadly, and as you may have already guessed, it isn't actually the case. As you often find over the border in Essex, the village here is named not after a Saint at all, but after the St Clere family. (Although less common in Suffolk, this type of village naming does occur in several places, notably Ashbocking and Stonham Aspal). The medieval dedication here was to All Saints, not to St Clare. 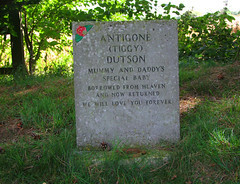 The modern dedication was adopted as recently as the 19th century, and although it would be possible to blame 18th century antiquarians for making the mistake that led to it (as is often the case) it seems an entirely reasonable mistake to make. 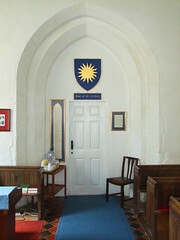 After the Puritan era, and before the Oxford Movement revival, Parish churches were usually named after their villages. 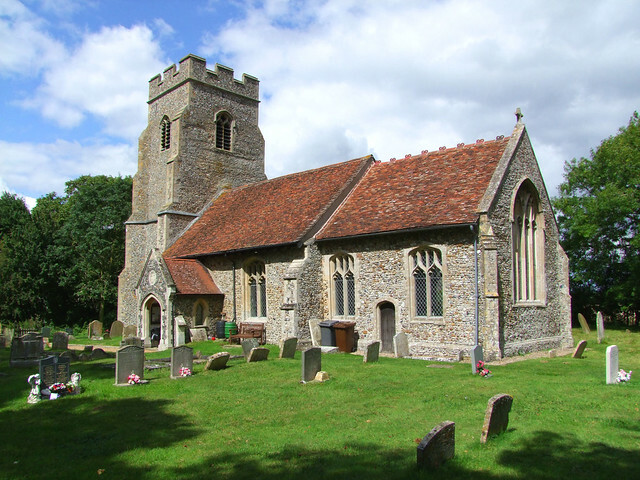 It seems natural that 'Bradfield St Clere Church' could easily become 'St Clare's Church'. 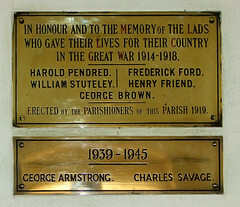 However, the modern Parish has happily adopted its new dedication, and why not? You cross a steep railway bridge over the now-vanished Sudbury to Bury line, part of which is a footpath to the south of here. You enter a hamlet of pleasant cottages, and the church is away in the fields, with an incongruously large water tower for company. The graveyard is beautifully sheltered, if a little overneat. The church itself also looks well cared for, its exterior bearing witness to the fact that the tower collapsed in a storm in 1873, and during the rebuilding the opportunity was taken to completely refurbish the rest of the structure. 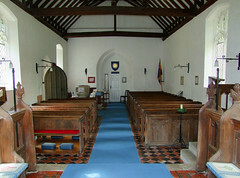 All except the chancel and nave walls dates from this time and later. The church is kept locked with a keyholder nearby. When I phoned, he briefly mistook my call for one bothering him about solar panels or mis-sold payment protection insurance, but eventually we each worked out what the other was talking about, and soon I stepped into a gorgeously warm interior, all limewash and polish. The church is full of light, the whiteness of the walls reflecting the sunshine pouring in through the high windows. The Victorian restoration was a good one, high quality work that has aged well. In any case, research has found little evidence that anything of any value or interest was destroyed by it; even in the late 18th and early 19th centuries antiquarians had found it, to quote David Davy, little in any way interesting. 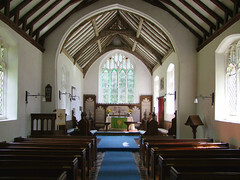 Offsetting the modern nave is the ancient chancel, rebuilt in the late 15th century. The roof is a delight, and again, light pours in through the seriously perpendicular windows. They give a sense that the church is bigger than it actually is. While I was finishing photographing the interior of the church, a man and his elderly mother arrived to have a look inside. As is often the case in a small, remote church, they were a little alarmed to find someone already inside, especially a wild-haired man in cycling clothes, but we said hello to each other politely. The man told me that he was pleased and surprised to find the church open, so I didn't disabuse him of this notion. His mother went up into the chancel, and the man confided in me "she's trying to work out if she's been here before, but it's not a very memorable church, is it", with which I had to agree, but I do like this church a lot. I like above all its sense of continuity, that here was a fairly simple parish church that had been buffeted and shaken by the winds of history, and had responded by reflecting the changing aesthetics, theologies and emotions of its parishioners.